Anyway... I had a taste for a little sweet somethin' somethin' the other night, but didn't really feel like putting in a lot of effort into it either. I knew I had a bowl of fresh apples, found some flour tortillas and remembered these apple enchiladas. And, goodie, goodie, I also had a little bit of homemade vanilla ice cream leftover in the freezer. Perfect. Nothing much could be easier either really. Stew the apples in butter and brown sugar and add a little apple pie spice. Place about 1/4 cup of the filling just off center on each of the tortillas. Fold one end over the filling, then tuck the sides in and finish rolling it up and put them all in a buttered 9 x 13 inch baking dish. Pour a boiled butter and sugar syrup all over the top, dust the top very lightly with some plain ground cinnamon and let them rest 20 minutes before baking. You can sprinkle on a little cinnamon sugar instead, but remember, these are being doused in sugar syrup, so go easy! How easy is that? 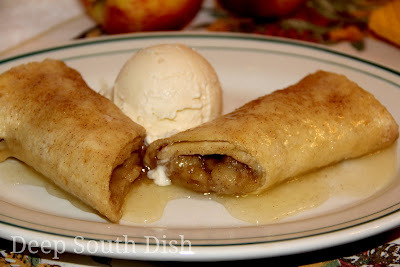 This recipe isn't at all unique to me, in fact, it's another one that, like the 7-up/Mountain Dew Crescent Apple Dumplings, has been around as long as I can remember and is, most often, traditionally made with apple pie filling. With fresh apples in season though, I figured I'd play around with it and use those instead. It's also a great dessert when made with canned biscuits that have been flattened, stuffed and sealed up like little purses. We're doing these as an apple stuffing rolled up in a tortilla. Now... before one of y'all starts fussin' with me about the name, I did not name these. This is what these have always been called, and that's about all I have to say about that. Let's just agree to relax and enjoy them and keep the fussing to something that is a little more important than dessert. Place onto serving plates while they are still warm, spoon some of the syrup on top of each one and serve with whipped cream, a scoop of ice cream, or a drizzle of heavy cream. One is a pretty hardy serving, so they can be split in half too. You could probably do this with less butter in the sugar syrup, and you could also probably sub in margarine. I'm giving you the traditional recipe and as always, leaving the substitutions up to you. Here's how to make them. In a skillet over medium heat, melt 3 tablespoons of butter with the brown sugar. Add the apples and cook over medium until apples begin to release juices. Reduce to medium low and simmer for about 15 minutes or until apples are very tender. Sprinkle apple pie spice on top, toss until well blended; mash slightly, taste to adjust seasoning and set aside to cool slightly. Bring the water, butter and granulated sugar to a boil. Boil, stirring regularly, for 3 minutes. Soften the tortillas in the microwave if needed to make them pliable and easier to roll. Butter a 9 x 13 inch baking dish. Add about 1/4 cup of the apple mixture slightly off the center of each tortilla, fold one end over the apples, then fold in the two sides and roll up, placing each into the prepared baking pan, seam side down. Pour the sugar water mixture all over the top of the enchiladas, dust very lightly with ground cinnamon and let the pan rest 20 minutes. Preheat oven to 350 degrees F and bake, uncovered, for 20 minutes. Place onto serving plates, spoon syrup on top, and serve warm with whipped cream, a scoop of ice cream, or a drizzle of heavy cream. Cook's Notes: To soften tortillas, place the stack between two damp paper towels and microwave for 20 to 30 seconds. May substitute one large (21 ounce) can of apple pie filling. May also use a half white and half brown sugar combination. Substitute a pinch each of cinnamon, allspice and ground ginger, to taste, for the apple pie spice. Egg Roll Variation: Substitute egg roll wrappers for the tortillas. Prepare as above, except reduce syrup by half, and bake without syrup. May also be fried (my preference). Drizzle with syrup before serving. Biscuit Variation: Instead of flour tortillas, substitute a 10 count can of flaky style biscuits. Separate each biscuit into two halves, for a total of 20 dough rounds, and press or roll thin. Divide the apple mixture evenly between all of the biscuits and pull dough up around, making little purses. Dab water on the edges of the points to seal and place into prepared baking pan. Pour the sugar syrup over the top and prepare as above. Oh those look good! Great idea! Oh lord! I can taste em now!!! Making these tonight for sure! Hope you enjoy them Connie! Hang around her long enough Joan and we're liable to adopt you!! This one kind of reminds me of my Mother's fried pies, she only made them in the fall or winter because it was too hot in the kitchen in the summer. You're welcome Susan! I hope she enjoys them!! I made something similar last night before I saw your recipe. Left out the butter and just browned the apples after I sprinkled them with sugar. Right before they were done I sprinkled cinnamon, all spice and fresh nutmeg on them. Also poured a little water in the pan to steam them a bit. Folded them into the tortillas and mine looked more like chimis. Fried them in canola oil and topped them with powdered sugar and vanilla ice cream. My sister used to make something like this every year for Christmas. She called them apple rolls. She used the canned biscuits. Those are excellent too Margie! Cinnamon, nutmeg and allspice are the ingredients!